A friend on Facebook pointed out that it was very clear outside tonight. I looked out of the window, and it was indeed – so I grabbed my telescope and decided to try harder at astrophotography (rather than plain old astronomy). In the past, stuff that has looked great through the eyepiece have been disappointing when captured on camera because of the lower magnification. I need a Barlow lens, but tonight I thought I’d try experimenting using a teleconverter instead. Venus has phases, just like the Moon. 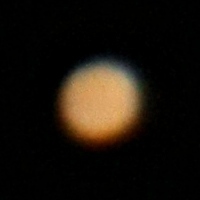 Here less than half of Venus is illuminated. If you look carefully, you can see a sliver of white around the top of Mars. This is its polar ice cap. I do have a modern EF-mount teleconverter but the camera refuses to work at all if you don’t attach a valid lens to the other side of it (a telescope mounted via a T-ring doesn’t count). So I was forced to use a 1970s FD-mount teleconverter which is actually better than the modern one, but it does mean I have to use an FD-EF adapter. Mine isn’t great and causes some aberrations. With all that teleconverting going on, the f/12 telescope quickly turns into an f/36 monstrosity. That’s pretty slow. 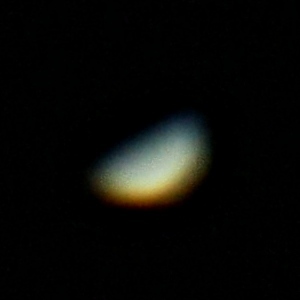 Nonetheless, Venus is still bright enough that I could capture it at ISO200, 1/50s. These images have had very little processing – they haven’t been stacked. I’ve only done an unsharp mask on them. They are pretty low resolution – even with a huge focal length you have to crop an awful lot to make a planet fill the frame. 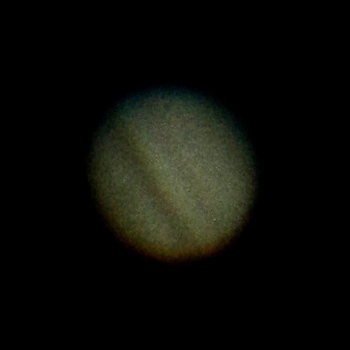 To improve on this, I would need a larger magnification teleconverter or Barlow lens. Teleconverters generally don’t come in higher powers than 3×, but I have seen Barlows at 5×. Trouble is, I’m already running into stability problems with the telescope’s tripod. It’s extremely hard to keep it still as it is! I’m not sure 5× would be possible on my tripod, and it’s well beyond the telescope’s highest useful magnification.